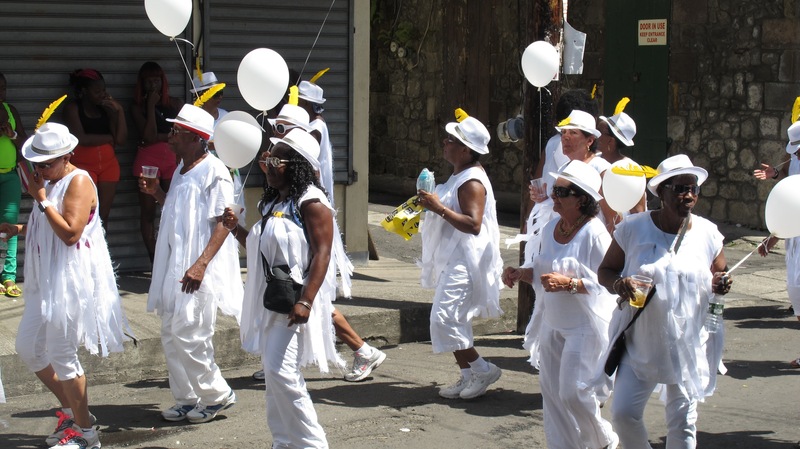 While Dominica’s 2013 Carnival Celebrations have come to a close, the high-flying spirit brought on by nearly two months of celebrating is still in the air. There are several aspects to Dominica’s Carnival including Calypso, Pageantry, and the Carnival *Jump-Up* Parades. Calypso is a wonderful Caribbean art form and Dominica is well-known for producing many talented Calypsonians – well rounded individuals who can sing, dance, write songs and, above all, PERFORM. Calypso Songs, often infused with double-entendre, address social ills, make statements about political or social positions, or simply entertain the listeners – sometimes a mixture of all three! These days, Dominica has two competing ‘tents’ (groups of Calypsonians) who each have their own weekly competition leading up to the Grand Finale Calypso Monarch Competition where one Monarch is crowned. Miss Dominica is crowned the Carnival Queen and goes on to represent Dominica in regional and international competitions, as well as being a spokesperson for her cause at home in Dominica. Also known as ‘playing mas’, two days of Carnival parades blanket the streets of Roseau from early Monday morning through late Tuesday night. Dominica’s Carnival is an up-close & personal experience, where you can easily join a costume band, a t-shirt band or a get a few friends together and join in Jouvert (4 am to 6 am Carnival Monday morning). Music, dancing, food & drink, vibrant splashes of colour, mixed with cultural heritage and Carnival’s own history, all blend together to make Dominica’s Carnival a unique and fun experience. All the contestants, led by the reigning Carnival King and Queen, participate in the costume parades on Carnival Monday & Tuesday.